You’re tasked with guarding your opponent’s best handler. You’ve seen them run circles around your teammates all game, but you’re ready to play some hard, shutdown defense. You set up close, ready to run hard and make a play. But as soon as they start moving, you feel utterly ineffective. They get open at will, even though you’re right next to them! You’re always a half step behind, watching this squirrely powerhouse slip away effortlessly. Feeling hopelessly out of control? Let’s zero in on some strategies to play effective handler defense1. Before jumping into what good handler defense looks like, it’s important to understand what exactly it is you’re defending. First things first, what is the role of a handler? In general, handlers are responsible for providing reliable reset options to retain possession, moving the disc laterally towards the break side to open up downfield throwing lanes, and distributing the disc to cutters downfield. With that role in mind, what sets skilled handlers apart? The best handlers have a wide arsenal of throws, making their break-side swings and throws to downfield space reliable and consistent. In addition, because handlers set up a bit closer to the person with the disc, they have much less space available to get open so they tend to be quick and agile. Now that you know what handlers are aiming to do and the skills they use to do it, how do you step up your defense? Take away the most dangerous option. Successful handler defense requires knowledge of what a handler’s most dangerous options are. Positioning is absolutely critical to handler defense, and knowing where handlers are likely to attack is half the battle. Skilled handlers don’t need much time or space to get open, so position yourself to take away their most dangerous options. But how do you know what to take away? In general, the person on the mark is responsible for preventing throws upfield to the break side. It follows, then, that as a handler defender you can proactively take away the handler’s options that result in them receiving the disc on the open side. Shut down open-side options while challenging break-side ones. Just like defending a cutter downfield, trust your mark to prevent throws to the break side so you can prioritize taking away cuts that allow the person you’re defending to get open on the open side. Your number one priority as a handler defender here is preventing the strike cut. 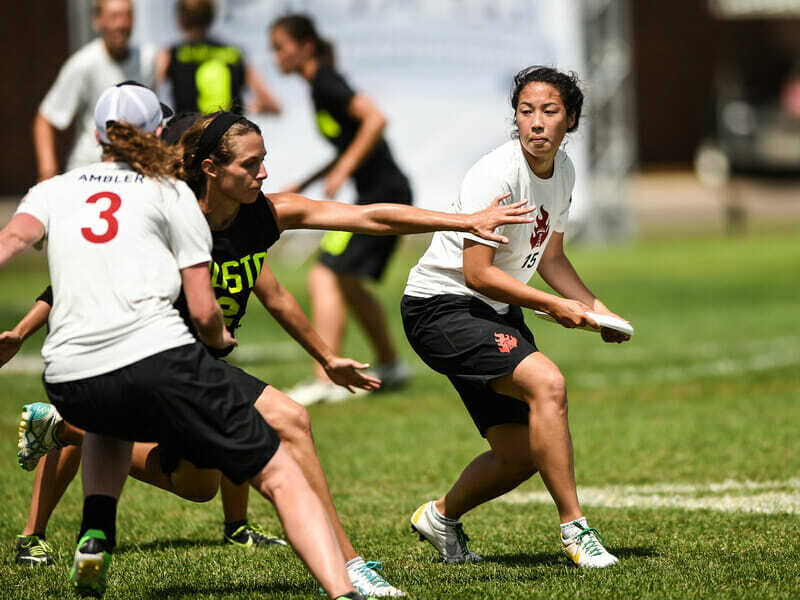 Handlers who set up on the break side want to make an aggressive upline cut, receiving the disc on the open side and gaining power position (momentum towards scoring endzone), which sets them up for a big huck. A strike cut from the dump. Position yourself in the lane between your person and the thrower’s open side (as shown by the red line in the figure above). Open your hips towards the thrower, triangulating so you can see both the disc and your person. Maintain a slight, 1-2 foot buffer; this way, if your person makes a strike cut, you’re in a great position to stay between them and the space they want to receive the disc in. If they cut back towards the break side for a swing, you’ll be close enough to also challenge that option. A dump cut for a swing. First, prevent an easy reset. 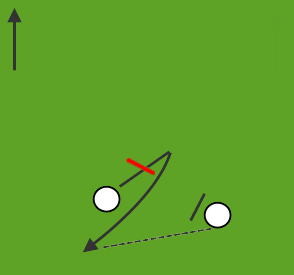 Handlers positioned on the open side are looking to create an easy dump throw which both allows them to reset the stall count — giving their cutters more chances to get open — and create give-and-go scenarios where a series of quick, short passes can change the angle of attack and have your team’s defenders running ragged. If your teammates are doing the hard work to deny downfield options, they will be understandably frustrated if you allow the handlers to continually reset the stall count cheaply. An open side reset look. Face your handler, get close to them, and open your hips so you can see the disc at the same time. This takes away the free pass that resets the count and could turn into fast give-and-go motion. It also keeps you close enough to challenge the dangerous “dishy” cut, where the dump cuts behind the person with the disc to receive an easy reset option with momentum towards the break side without requiring an aggressive break throw from the thrower. This is a prime opportunity for a continuation swing and a great way to open up cutting lanes downfield, giving the handler lots of space to hit open receivers downfield. A dishy dump cut to the break side. If they go for a dishy dump from here, you’re in a great position to make it difficult for them to get open. Fight the urge to face-guard — crafty handlers have reliable throws to space, so if you focus entirely on the handler you’re guarding, you won’t be able to react to discs in the air. Chances are, your team or one of your opponents runs a handler cut that isn’t detailed here. Regardless of the cut, the handler’s role — move the disc towards the break side, provide resets, and distribute the disc downfield — doesn’t change, and neither do the basic principles governing good handler defense. Maybe your team defends things a little differently. You might encourage poaching or defensive switches in particular scenarios. That’s great — keep doing what you’re doing, just make sure everyone knows what their priorities are and what they can proactively take away. These positioning tips aren’t the be-all end-all of handler defense (no single positioning choice could completely take away all dump options), they’re just a solid place to start if you find yourself frustrated and out of position. Anticipate the next dangerous option. It’s not enough to just shut down a handler’s most dangerous option; you must also anticipate their next move. Skilled handlers are adept at getting open in one-on-one matchups in small spaces, so don’t panic if you get beat. Instead, learn to see the field as a handler, anticipate where they will likely look next, and make their favorite options less ideal. Many novice handler defenders compensate for poor initial positioning with reckless intensity, putting themselves even further out of position. Avoid this by keeping your responsibility in mind. When the disc moves, how does your responsibility change? If your handler receives the disc, you’re responsible for setting a mark and preventing the next break-side throw. If your handler then throws to another player, you’re responsible for anticipating where your handler could attack to receive the disc again. Your handler gets open on a strike cut. Frustrated that you got beat, you sprint to make up lost ground and over-commit all the way to the open side, leaving the break side vulnerable. Instead of over-committing, intentionally set a strong mark and fulfill your responsibility of taking away break side throws. Your handler gets open on a swing cut. Eager to set your mark and start stalling as quickly as possible, you run straight to them, neglecting to take away the continuation swing. 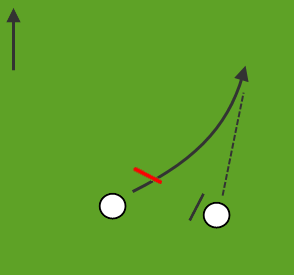 Instead, “swoop”2 to set the mark — get in the break-side lane first, check over your shoulder to see what continuation options the thrower has, and then tighten down in a more traditional mark. Your handler has the disc and throws to an easy reset on the open side. You hesitate for a second, thinking your job is done, and your handler attacks with a strike cut that starts a chain of frustratingly fast give-go handler movement. Instead of relaxing once your opponent has moved the disc here, know that an open side throw sets your handler up for a strike cut. Anticipate this movement and immediately set up your buffer in that strike cut lane. Learning to anticipate where a handler will go next can be tricky business. Gain this field vision by watching video of elite teams and focusing on the handlers. As the disc moves, how do the handlers reposition themselves? When do they cut and when are their cuts effective? Take this knowledge and apply it to your own handler defense. Every time the disc moves, ask yourself: What’s the next most dangerous thing this handler could do and how can I prevent it? Improve your agility, quickness, and balance. Even perfect positioning and excellent anticipation can be outmaneuvered by a quick, explosive handler. Focus on improving your own agility and quickness to up your handler defense. Before hitting the agility ladder, there’s a couple small tweaks you can make to your posture and balance that can help give you the upper hand. Maintain a comfortable and athletic stance, with a slight bend in your knees and your weight in the balls of your feet — you’ll be ready to move at a moment’s notice instead of getting caught flatfooted. Keep your balance and stay in control by taking short, powerful steps instead of large, lunging ones. As your handler cuts, keep your hips open and move laterally for as long as possible — don’t turn your hips in the direction your handler is moving until absolutely necessary. These slight shifts will keep you from overcommitting, losing your balance, and feeling taken aback by your handler’s quick, explosive movement. Off the field, build overall agility and quickness by incorporating footwork exercises and lots of short changes of direction into your workouts. Agility ladders and jump rope workouts are great ways to focus on footwork; serpentine drills and short shuttle sprints focus in on changes of direction. Make sure these changes of direction incorporate backwards and lateral movement, too — ultimate (and handler defense in particular) is a multi-directional sport. Put in the work off the field, and you’ll feel more confident and in control in your matchup. Next time you take that tough handler matchup, take a breath and remember what you need to do to be in control. Know their most dangerous options — position yourself proactively to take away the option you’re responsible for. Know where they’re likely to look next — anticipate their movement and beat them to the space they want to use. Know that they are hoping to beat your with quickness and agility — find your own athletic body positioning and rely on the agility you’ve built off the field to challenge them. Use these principles to your advantage and shut that handler down! Kayla Emrick is a graduate student in public health at Emory University. She started playing ultimate at Oberlin College in 2009 and later captained the team. She currently plays for Ozone in Atlanta and coaches Luna, the women's team at Emory. Comments on "Tuesday Tips: The Fundamentals of Handler Defense"